The Eastfield Harvester basketball team has started its journey to avenge the heartbreaking loss from last year’s conference tournament. 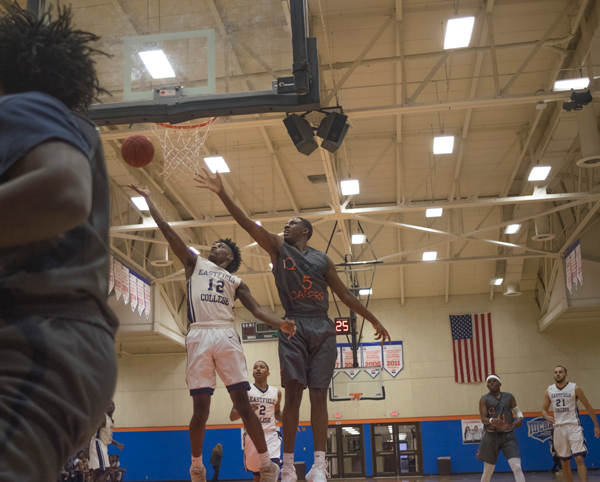 The team expected to bring home a national championship, but fell to a Brookhaven team, who went winless in conference play, in the first round of the conference tournament. Sophomore guard JJ Murray believes the team took their opponent too lightly and slipped up. “We didn’t go into the game as mentally prepared as we should’ve been,” he said. Coach Anthony Fletcher knew that Brookhaven didn’t play like an 0-10 team, which added to the disappointment of the loss. Only six players from last year’s team have returned this season. Only two of those are starters, Murray and sophomore guard Sean Odum. The team has brought in a new class of freshmen who will be asked to perform prominent roles in the team. “We need some of them to come and help us pretty quick,” Murray said. The freshmen’s role will largely determine the team’s success. Freshman guard Anthony McGee, who was the district MVP last year from Mesquite High School, is second on the team in scoring through the first two games of the season with 13.5 points per game. Freshman guard Danny Salamah came off the bench hot against Tomball Junior College, dropping 21 points in 21 minutes en route to a 120-83 win on Nov. 4. Fletcher believes the mix of veterans and with the freshman will be beneficial to the team. His system consists of more than 70 plays, which the sophomores have already learned. Murray said their experience with the system will help the new players learn it. “They can kinda help show some of the new guys just how we like to play here,” Murray said. The team plans to play the same fast-paced style that powered their attack in previous seasons. The team led the nation in scoring last season, averaging 109 points per game. Eastfield was one of only two teams in the nation to average triple digits in points. They also were second in 3-pointers made last season and aim to do so again. Fletcher says the team plays a very similar style to the Golden State Warriors of the NBA, who are the defending champions. Their ball movement and quick transition plays lead to plenty of open shots, making the game much easier as opposed to long isolation possessions. This play style helped get nationally ranked in the top 10 for most of last season, including a peak position of No. 1 in the country during the week of Dec. 6. Fletcher believes this is one of the most complete teams he has coached over the past nine years. Eastfield is already on track to get back to the tournament, having beaten two four-year colleges in the preseason. They started the preseason against IQ Hoops Prep, beating them 94-75. Murray went off for 28 points and the team collected 18 steals on defense. They followed that with an easy win over Tomball JC 120-83, scoring 16 3-pointers at 46 percent efficiency. The team is currently fourth in the nation in scoring. In past years, the team has proven they can compete with Division I schools and is on track to prove that this year as well. Murray said this year’s team is hungry and determined. Those who remained from last year’s squad are seeking redemption, while the freshmen are looking to establish themselves as legitimate college basketball players. They have goals of following players like D’Angelo Streeter, who transferred to Division II school Angelo State University last summer. They host a match against Jarvis Christian College, a four-year NAIA college, Nov. 11. The team will hold a “Orange Out” game Nov. 28 for school spirit. Conference play begins in January, featuring a home rematch with Brookhaven on Jan. 27. The full season schedule can be found online at eastfieldnews.com/2017/11/02/basketballsched/.